As summertime rolls around, so, too, comes that special time of year when we celebrate those we love, as well as those who are in love. This is the major mid-year milestone, when the big retailers roll out the red carpet to shoppers eager to give gifts to dads, grads and summer brides. Attentive online sellers are stepping up, too, recognizing they have a golden opportunity to serve these shoppers in ways big businesses can't. With targeted merchandising plans at the ready, small-business entrepreneurs are offering unique and unforgettable gifts that mean more than those mass-produced goods. If you've previously overlooked this key selling season, now is the time to get your merchandising juices flowing. Here are some ideas to help you get the most from your mid-year marketing. It seems like every year it gets a bit harder to shop for Dad, doesn't it? Having already collected an egregious amount of neckties, barbeque utensils and garden tools, Dad is ready for the sort of gift that's more aligned with his interests. You can help gift-givers deliver what Dad really wants when you indicate your offerings are Dad-friendly, the gift he really wants. If you deal in sports-centric goods, be they equipment or collectibles, announce you have gifts for the sports-loving dad. Some dads love entertainment items and, if you have goods that appeal to the music- or movie-loving dad, herald that to Father's Day shoppers. And, if you have miscellaneous vintage items that date back 30 or 40 years (or more), offer up these curiosities for dads who might be delighted to receive a trinket from good times gone by. Here's a truly targeted tip that might give you a real edge with your Father's Day shoppers: Invite customers to send their specific item requests direct to you via e-mail. If you have the sorts of goods buyers think might please Dad (but perhaps not exactly what he said he wants), give your shoppers the easy opportunity to specify precisely what it is they're searching for—it might be in your inventory. Even if you don't have the exact item a customer is wanting, you might be able to offer valuable information that will help them in their quest. This is a customer service point that always impresses shoppers, and often encourages them to remember you as a preferred (and helpful) seller. Of course, if you have some real wacky neckties in your inventory, go ahead and display them proudly. It couldn't hurt. If you believe the long-standing "graduation industry" still has the corner on the pomp-and-circumstance market, think again. Yes, there are established businesses that cater to the matters of grad announcements and portraiture, yet they aren't marketing to the graduate. Today, graduates are hopeful to receive gifts that are useful to them in the next endeavors, yet they're also happy to get gifts that are fun. When you market to graduates, remember that you're marketing to a wide and varied population. 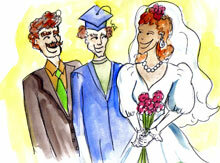 Graduates can be as young a grammar-school students and as old as grandparents. For the younger students, prominently display graduate-style clothing. Considering so many parents are faced with outfitting their primary-grade graduate in frock that might see only a single use, those who sell lightly used clothing online can help take the bite out of the bill while making a graduate happy over their grad-night attire. For middle- and high-school students, display all manner of fashion accessories (jewelry, sunglasses and so on) as well as techie gadgets such as calculators, PDAs and other nifty, yet useful tools. Also, don't forget the functional, fun and even funky items a college-bound student will want for their dorm room. Vintage '70s and '80s goods are popular with this age group these days. College grads are likely appreciative of any sorts of goods that will help them along their way in their future endeavors but also enjoy items that will commemorate their achievement. Vintage goods are also a hit with these graduates—offer them an item that harkens back to the start of their educational journey. Sometimes you have to pity the young, wide-eyed couple in love, eager to tie the knot, yet finding themselves adrift in an unfriendly sea churned up by the pricey wedding industry. Although the bride's parents traditionally pick up the wedding tab, some less-fortunate couples have to foot some or all the bill themselves. The online seller specializing in wedding items can really save the day, answering the call to provide cost-conscious alternatives to the young couple. If you have wedding-related items to offer—centerpieces, cake toppers, wedding dresses and so on—make sure to give your sales strategy a noticeable push with offers and solutions for a cash-strapped couple. Better yet, consider offering your own version of a wedding registry. These days, couples are sometimes searching for a different way to celebrate their union, and could be delighted to let friends and family know that you're selling some of the items they want most. Don't forget to consider a free gift-wrapping service for those wedding gifts—it might be an added incentive to convince shoppers to buy from your site. If you hope to harness the sales potential that mid-year brings, be sure to get your products properly positioned right away and your advertising in place just as quick. And, don't forget that these shoppers will need fast service, so be sure to offer easy Buy It Now purchase options, online payment options, and fast and reliable shipping methods. Your sensitivity to the mid-year shoppers' situation, along with offering the sorts of goods they want to buy, will make your online venue a well-rounded and well-positioned destination for the summertime gift giver's needs. Study shows search engine usage depends on the product. Experts hope upward trend continues into summer.